I received an email from one of my vendors tonight that has done business in Haiti for more than 20 years. They are providing care packages for families that are in need and sending them to a friend to help distribute them. I wanted to share this in case anyone would like to donate. I know there are many scams out there that benefit from tragedies, but I know this is not one of them. This couple is dedicated to helping those in need and buys many of their products from hard working families. They even have a "Kids Foundation" set up. So this is the email below. Please read and help in any way that you can. Thank you! And remember even $5 will help. As most of you know, Haiti was hit by a devastating earthquake last week. As some of you may know, Susan and I have been doing business in Haiti for over 20 years. We’ve developed many friends there that we consider our extended family, and we both feel a bit helpless not being able to do more, faster. So after much consideration we have come up with a care package that we know will be handed directly to the people that need it most. 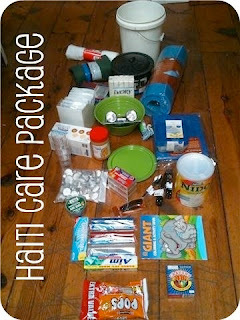 Having travelled to Haiti for over 20 years, we recognized what is considered necessities in helping start up a new household. 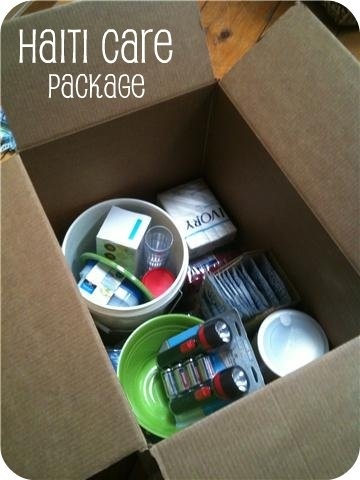 This care package consists of the following items that will be packed in a box small enough so each recipient can easily carry it. 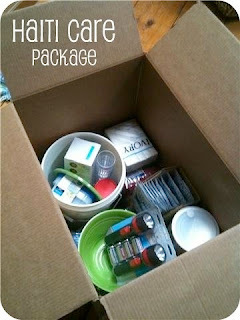 The total cost of each care package is approximately $100 USD. We have already ordered all of the ingredients to make 200 care packages. Once they are packed, they will be loaded on a trailer and sent to our custom broker’s warehouse in Miami, FL. As soon as the port is operational again in Haiti, the packages will immediately be sent by ship. Once they arrive in Port-Au-Prince, they will be picked up by my friend Victor Boulos and taken to his factory where they will be distributed to those in need. Or you can go online to the following link: http://pledgie.com/campaigns/426. All administrative expenses are paid by our company, therefore every penny will go toward this effort. Any amount you can give is appreciated and 100% tax deductible. Thanks and please forward this to all of your friends. 50% of all sales at her Etsy Store Pure Joy Creative will be donated so be sure to make your donations there. She has beautiful items listed! Make purchase before Friday, Jan. 29th by noon. Thanks!